In a veiled attack on Pakistan, Vice President M Venkaiah Naidu today warned that any effort to destabilise India would not be tolerated. He said that nationalism was a unifying spirit and was incompatible with sectarianism. “It is unfortunate that our neighbour has been aiding, abetting, funding and training terrorist groups. This attempt to destabilise and impede out progress can no longer be tolerated. 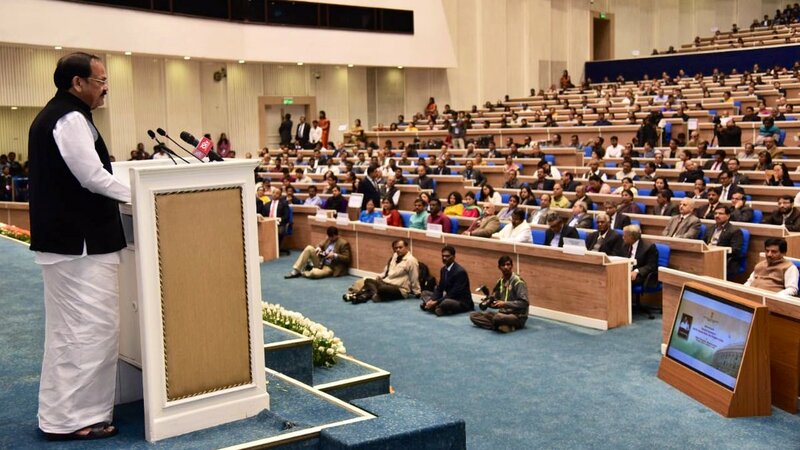 We must stand united in our resolve to make every inch of our motherland a safer place,” Vice President said while addressing a gathering here at Vigyan Bhavan after the release of his book “Selected Speeches of Vice President”. The book was released by the former President of India Pranab Mukherjee, who praised Naidu for his social and political service to the nation. As the function held a day after the ghastly terror attack on a CRPF convoy in Jammu & Kashmir, participants mourned the loss of lives of the soldiers by observing silence. Speaking on the occasion, Mr Naidu stressed that “Nationalism is all about asserting that ‘I am Indian first’. It is an overarching umbrella under which all our immediate identities are subsumed to form a larger collective. Unfortunately, certain misinformed individuals and organisations are fomenting trouble, and creating divisions where none existed before.” Nationalism implies sharing a common past, a common present and a common future and in our country that has shown the power of peaceful coexistence and non-violence to the world, the acts of bigotry and narrow sectarianism should be strongly condemned. Referring to the Polls soon to be held for Lok Sabha and some State Assemblies, Mr. Naidu said “I would like to see more men and women being elected as legislators and parliamentarians with national outlook and having in them the four virtues of Character, Calibre, Capacity and Conduct” and not to allow the political system to be vitiated by Cash, Caste, Community and Criminality. He urged the people to demand a report card from the public representatives and make a critical assessment of their effectiveness at the time of voting in the elections. Conveying anguish over chronic disruptions in legislatures, Naidu said: “Dysfunctional legislatures strengthen the demand for ‘recall of legislators’. I am afraid we are close to this stage if things do not change”. Stating that our legislatures instead of becoming effective forums of debate, are being reduced to ‘disruptive platforms’, Shri Naidu said “Against the backdrop of worrisome functioning of our Parliament and State Legislatures, this disruptive, dysfunctional tendency needs to be made an election issue”. Referring to the just concluded Budget Session, the Chairman of Rajya Sabha Shri Naidu said that it was a matter of concern that despite the political slugfest over farm sector distress, the Members of Rajya Sabha and the parties did not find it necessary to discuss the direct income assistance to farmers announced in the interim Budget. He also noted that the Motion of Thanks to the President should have been adopted after detailed discussion. He particularly expressed concern over some leaders in Rajya Sabha telling him in the daily morning meetings that normal functioning of the House for the day cannot be allowed under instructions further to cropping up of some issue or the other instead of raising the same in the House. Mr Naidu urged the MEDIA to function as Medium of Empowerment for Development through Informed Actions and to correlate the text with the context for informed communication to the readers and viewers. The Union Minister for Social Justice and Empowerment, Thaawar Chand Gehlot, the Minister of State for Youth Affairs & Sports and Information & Broadcasting (I/C), Col. Rajyavardhan Singh Rathore, the Deputy Chairman, Rajya Sabha, Harivansh, the Secretary to the Vice President, Dr. I.V. Subba Rao, the Secretary, Ministry of I&B, Amit Khare and other dignitaries were present on the occasion.